This simple principle, which is borrowed from a chapter of Robert Kiyosaki’s best-selling book, “Rich Dad, Poor Dad”, at first doesn’t actually sound that informative or effective. But after it is explained, it can transform the way you look at your future, and in turn, how you plan for it. 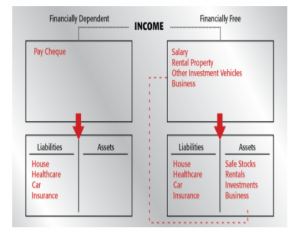 Essentially, what separates a “Financially Free person” from a “Financially Dependent person” is that the Financially Free person ensures their money works for them. They look at the long term. Assets are wealth-generating machines. The Financially Free individual may have many different income streams but they also manage their time effectively. The best way to explain it is in the form of the table, below.